(cooked butter-flour base for sauces), stir in flour, salt, nutmeg, and pepper and cook until mixture bubbles continuously for 1 minute. Remove from heat. Stirring constantly with a wire whisk, gradually add milk. Return to heat and cook, continuing to stir constantly, until sauce boils and thickens to the consistency of a thick paste. Turn off heat. With a spoon, lightly beat egg yolks. Spoon about 2 tbsp of the sauce into the yolks and stir until all the sauce has been incorporated. Stir egg yolk mixture back into sauce. Stir in cheese until it melts; set aside. Beat egg whites until frothy. Add cream of tartar and beat until soft, moist, stiff peaks form. Fold about 1/3 of the beaten whites into the sauce mixture. Then add sauce to egg whites by carefully pouring sauce into spaces left when first 1/3 of the egg whites was removed. Gently fold sauce and whites together. Pour into a well-buttered 1 1/2 qt. 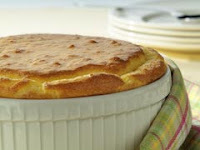 souffle dish. For flat-top souffle gently smooth top with rubber spatula. For a top-hat, draw a circle on surface of souffle, and inch or so in from rim, with tip of knife or spoon. Bake for 10 minutes at 450 degrees, then reduce temperature to 250 degrees and bake for 10 to 15 minutes, or until top is golden and center jiggles only slightly when gently shaken. When you do this test for doneness, make it quick and close oven door promptly. If temperature drops excessively, souffle may sink. Spoon into plates. Recipe from Sunset Magazine's "Easy Basics for good Cooking"